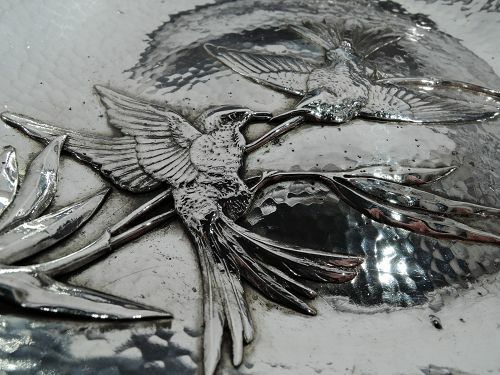 A Tiffany mixed metal piece is a wonderful addition to any room in your home. From tea sets and pitchers to trays and Tiffany silver bowls, you can find the perfect items to add to your collection at Nelson & Nelson. Some designs include birds, lily pads, landscaping, flowers, and more. The exquisite detailing and beautiful finishes appeal to a wide variety of style preferences and decor themes. With hand-hammered patterns and other exterior design selections, youre sure to find something that complements your individual style. With our large selection of Tiffany mixed metal items, youll be one step closer to completing your room with a spectacular statement piece. 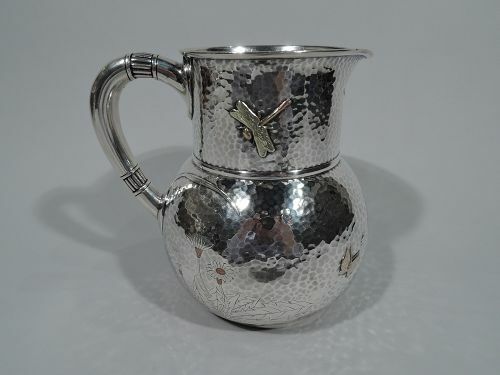 Browse our collection today, because a Tiffany silver bowl or mixed metal coffeepot could be exactly what youre looking for. 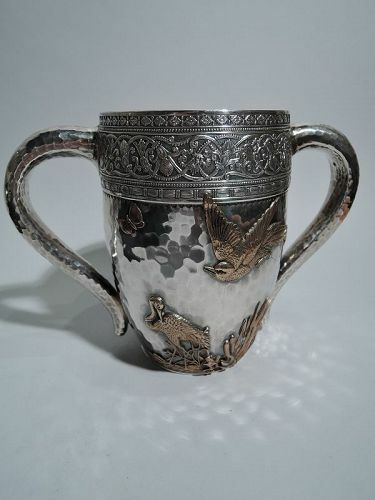 Japonesque sterling silver sake pot. 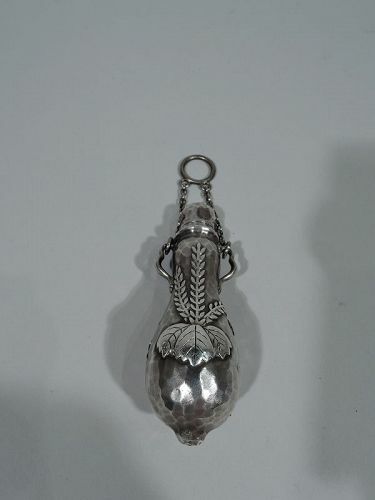 Made by Tiffany & Co. in New York, ca 1880. Globular with short and tapering diagonal spout and stationary bracket handle. Cover inset with jade bead finial on petal mount. Allover honeycomb hand hammering. Applied ornament. Top part has scalloped border with overlapping leaves. Bug (beetle) near spout. Date (December 5) with years 1865 and 1890 engraved on cover. Interlaced script monogram engraved to pot underside. 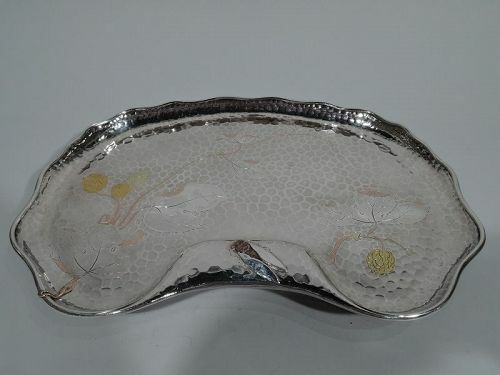 Japonesque sterling silver tray. 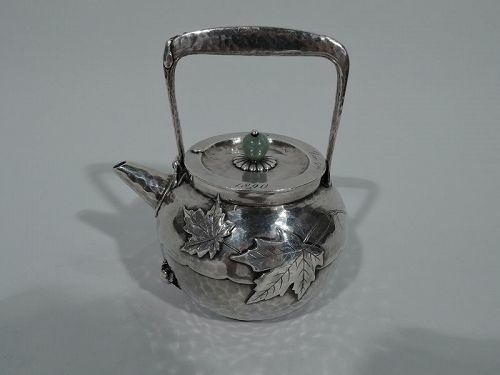 Made by Tiffany & Co. in New York, ca 1878. Kidney-form with wavy and molded rim and four double volute-scroll supports. Mixed-metal ornament on hand-hammered honeycomb ground: Loose and elongated branch with leaves and hop blossoms that spills over rim. Cicada applied to handle. Fully marked including pattern no. 5291 (first produced in 1878), director’s letter M (1873-91), and phrase “Sterling silver / and / other metals”. Fine condition. 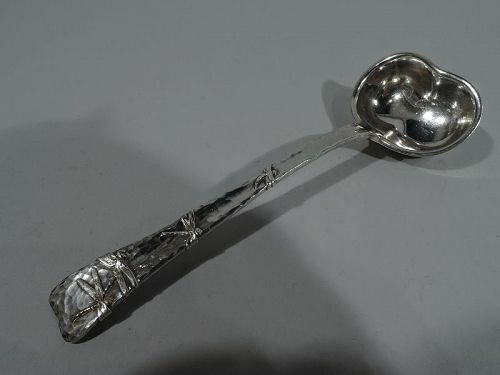 Japonesque sterling silver bowl. Made by Gorham in Providence in 1879. Four curved sides and short round ribbed foot. A pair of humming birds with flapping wings go beak-to-beak perched on a leafy branch. A third flies solo. Hand-hammered honeycomb ground. Beautiful craftsmanship in the exotic mode. Fully marked with maker’s stamp, no. 1580, “sterling”, and date code. Very good condition. 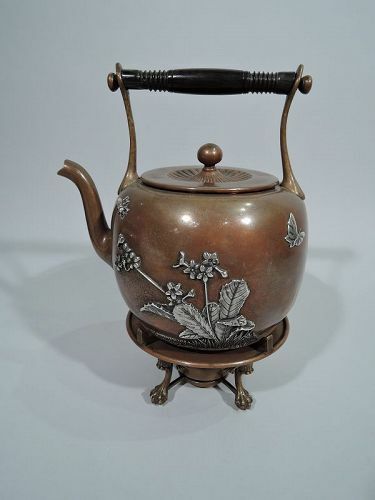 Japonesque mixed metal tea caddy. Made by Gorham in Providence, ca 1880. 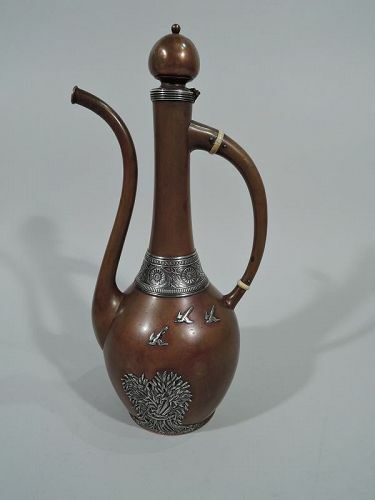 Ginger-jar form with curved and tapering sides, and short inset neck with cover. 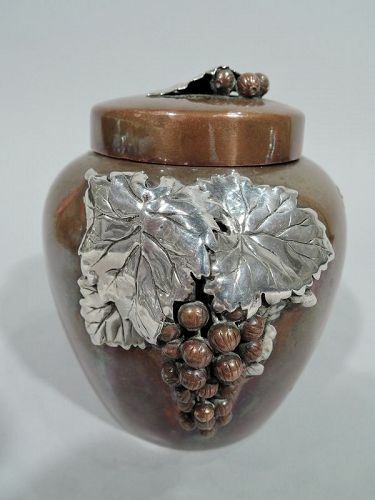 Grape bunch, stem flower rooted in granulated soil, leaf and nuts, and butterflies applied to copper ground. 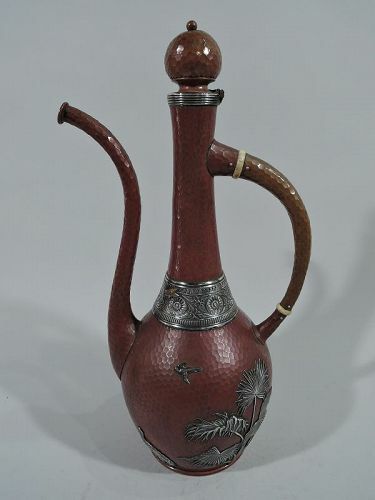 A wonderful period piece ready to be filled with your favorite blend. Hallmark includes no. Y160. Very good condition. 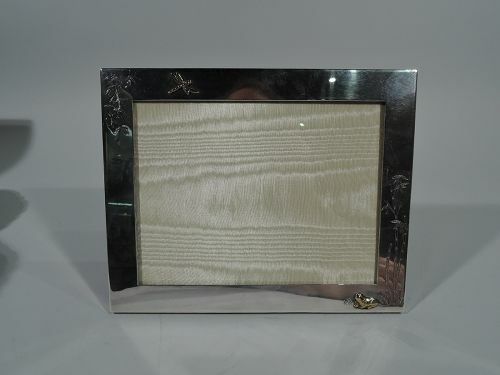 Japonesque Revival sterling silver and mixed metal picture frame. Made by Tiffany & Co in New York, ca 1970. Rectangular window and flat surround with engraved bamboo and mixed metal appliques, including a dragonfly – a perennial symbol of the modish exoticism associated with Tiffany since the late 19th-century. With glass, silk lining, and laminate back and hinged support. For landscape (horizontal) display. Hallmark includes postwar pattern no. 26005/95. Very good condition.